0600-0700hrs - A full moon and almost clear skies which made it quite light at early doors. Also a ground frost this morning, which we did not have the previous night (Monday), although today’s ground frost was by far lighter than we have come to experience in the more recent past. Coming down Clawthorpe road towards “Sunny Glen” I had six male Blackbirds, close together and holding debate deciding who gets what!! I’ll bet that debate turned to “scrapping” shortly afterwards. 0900-1200hrs – Dalton, Trig, Lancelot Clark Storth, Storth Woods, Dalton. I was audience for some fifteen minutes and held spellbound listening to the sweetest of many calls coming from a Song Thrush which was on the highest point of the tallest tree, delivering his continual squeaks, squeals, chatters, wolf whistles and lots, lots, more. I should have stayed much longer listening to him, it was just the ticket! Probably the best entertainment around and natural and free, and a mean feast to try and understand. He was holding his “high stage” just close to the bottom of the Dalton Crags incline. I tried to decipher some of the stuff he was singing, which went something like: 1) weehoo, weehoo, 2) Wee-hoo-wit, wee-hoo-wit, 3) Wit-woo, Wit-woo, 4) her-kleep-kleep, her-kleep-kleep, 5) Chit-chit-chit-chit 6) See-it, see-it (7) The yaffle call of the Green Woodpecker and (8) Lots of Starling chuckling mimickry. He delivered most of the mixed bag with a “immediate repeat” of the same syllables (as shown above), and would then start to sing them all jumbled up. But really there could have been lots more on offer if I had stayed longer. In these very fortunate situations I really do need to spend more time “listening and taking it all in” for today it had certainly started my “adventures” off in the most cheering and refreshed of mind. (It also took me back to 29th June 2011 when I was listening to a versatile Song Thrush over at Pickles Wood, and this one did the most wonderful of impressions of the Curlew and the Oystercatcher, but the best of all had to be the impression of the “Trimphone”. I just couldn’t believe what I was hearing. Hurray! a Skylark was seen crossing over Dalton from East to West, another Pecker (Great Spotted) was heard drumming from near where the Charcoal Burners used to be. And whilst climbing up through the deforested track, I was met with what at first appeared to be lots of “little white fairies” daintily dancing in the vertical at various stages. They were almost silver in true colour and a lot larger and far longer winged than the conventional “midge”. But whatever they were obviously they had been a fresh “hatch” this very morning. A Green Woodpecker was “yaffling” from down at Dalton Woods, with its sound almost drowned out by the gaggling calls made by two passing Greylags overhead traversing from East to West. At the Trig Point, another Song Thrush was in full song, again on the highest branch on the tallest tree some 200 yards North West in line with the pathway which leads to the Cairns. Also another Green Woodpecker was “yaffling” from somewhere over towards Park Wood direction. Crossing over into Lancelot Storth and breaking any surface ice in the large black cattle troughs. 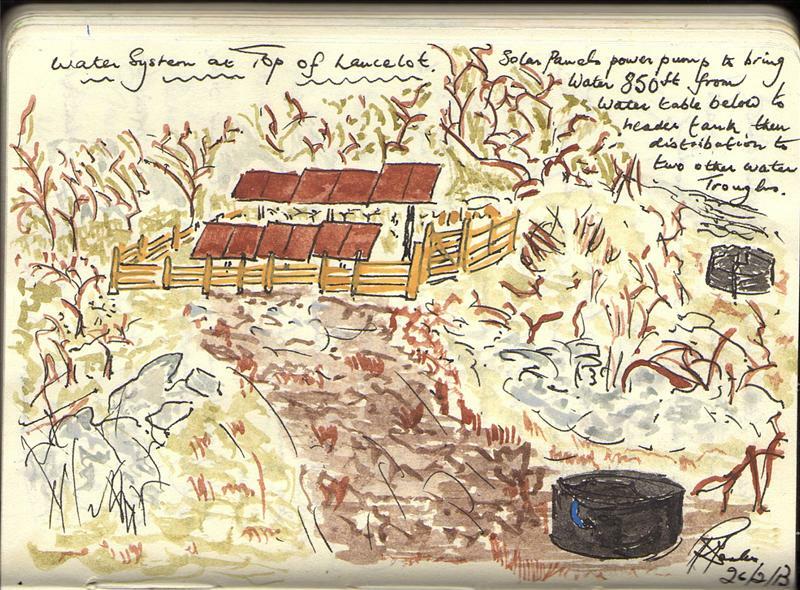 I decided to do a small ten minute sketch of the solar panels and the water tubs and its surroundings. Whilst doing the sketch I had a bird constantly singing from further back beyond the panels. Although I could hear it reasonably clear, I just couldn’t see it although I did recognize the “type” of call to be conducive with a member of the “Bunting” family. Instead of going down and checking it out like I would normally have done, for some reason I just get so ingrossed with my sketch and by the time I had finished it the bird had flown. Another pair of Green Woodpeckers were reverse calling to one another from further down and across to the North West side close to the Burton Fell boundary. At the rear of the Dalton hamlet from within the Storth woodland, there was such a enormous explosive cackling noise came from overhead when four male Blackbirds were chasing one another and having a scrap in the process. It really does look like bullying tactics may be used here! 0600hrs – 0700hrs – Heavy ground frost today. (0630hrs) Saw a Brown Hare going down the lane towards Henridding which then jumped over the wall into the fields. A lovely singing Song Thrush was calling from Russell Farm in Dalton, to the rear of the “ancient stone circle”, and it was still singing away from the same spot later at 0830hrs. Also it looked like being the morning of the “Dunnocks”, because on Vicarage Lane they appeared to be singing from everywhere. It certainly suggested today for some reason there was definitely something starting to happen with this species. A pecker (Great Spotted) was heard again drumming, and also another fabulous singing Song Thrush were calling from Curwen Wood at the “Claw House corner. Also a Bullfinch was quietly “piping” away at The Woodlands. Disturbed three Lapwings within the fields of Russell Farm, they noisily ascended and headed off to the West. Also heard the quiet piping of Bullfinch at nineteen trees. Yesterdays Song Thrush at Dalton Crags was again “serenading” with his versatile repertoire. 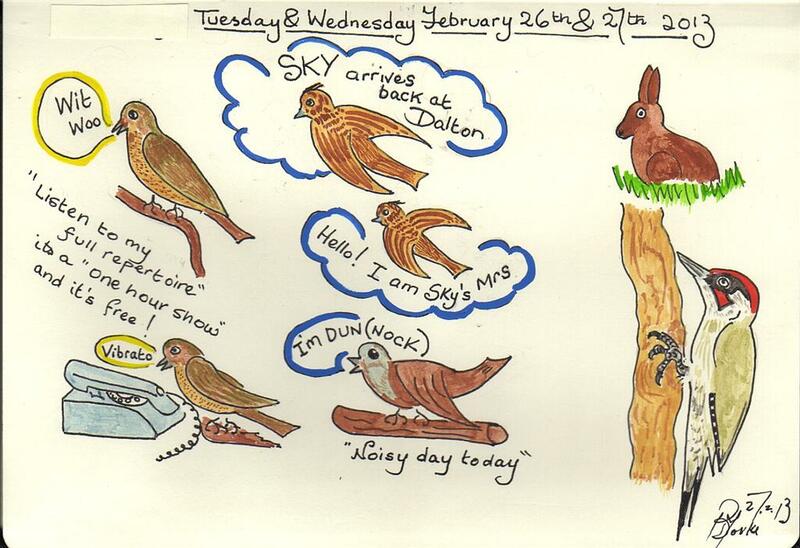 And whilst climbing up through the “deforested” at Dalton, a lovely surprise awaits with the melodious greeting from SKY (our resident Skylark at this spot) who broke into full song along with another bird nearby which after seeing them together earlier, presumed the other bird to be SKY’s good lady. In fact on my approach there were actually four birds, one of which left the others and traversed high and to the West. On my approach to the Trig and whilst there, even more Skylarks could be heard passing overhead North. Still no Mipits to mention. A Green Woodpecker “yaffling” from Lancelot bottom close to Pickles Wood and further Bullfinch “piping” on my return past Browside on Vicarage Lane.